are made in Germany from Beechwood, which is triple glued and polished to a smooth finish. The hoops come with sturdy Brass screws and fittings that will not bend. 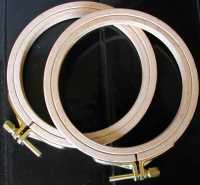 are made from Beechwood which is triple glued and polished to a smooth finish, the hoops come with sturdy screws and fittings that will not bend. 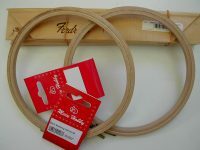 are made in Australia from Ash/Oak and are ideal for Crewel Embroidery, Goldwork etc where work needs to remain drum tight. Unlike roller frames, the side bars are held apart with cotter pins which means they will not not slacken off. 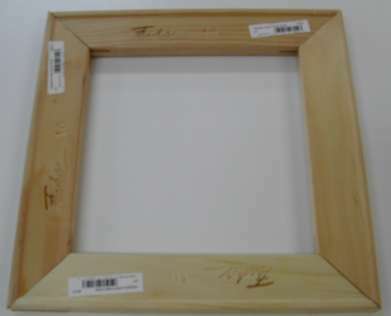 Prices are for ALL 4 pieces of the frame. The size is the length of the white tape not the wood bar. Side bars are approximately the same length as the top and bottom bars. 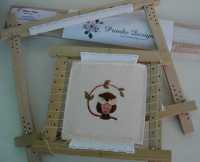 come in sets of 2 bars, use them to staple your Canvas work to, or they can be laced over. The bars click together to form either square or rectangular frames.